ICT Academy is an organization engaged in Vocational Training, Education and Research Activities focused on Innovation and Quality. Created in 2008 by the former IT students of ITHUM srl and their need to create a community focused on IT education and news is now strongly focused on research, experimentation and integration of innovative teaching methods. (Find out our projects!). That's why we work with international Program such as: Cisco Academy, VMware IT Academy Program, LPI, Oracle Academy. Here's all the details! One of the Programs we're hard work into is the VMware IT Academy Program. ICT Academy is a Regional VMware IT Academy - an internationally recognized Academy able to qualify other structures in the Program and train the Instructors. 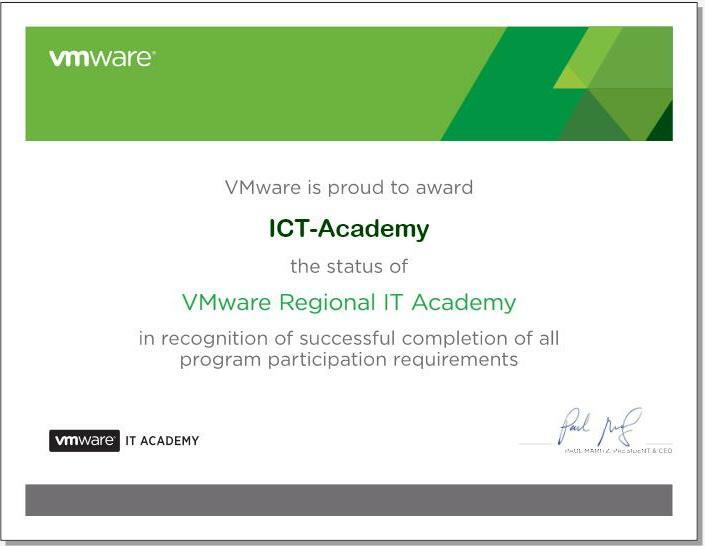 VMware is pleased to announce that ICT Academy in Rome has become a VMware Regional IT Academy. In this role, ITC-Academy will not only be preparing their students to become VMware Certified Professionals, but also to assist other schools in Italy to become VMware IT Academies. "We are extremely pleased to be working with ITC-Academy on this exciting project. Having the support and leadership of ITC-Academy, will ensure the success of introducing students to VMware technologies and equip them with VMware technical skills to complement their chosen fields of study. By adopting this program, academic institutions can enable their students to obtain the VMware Certified Professional status and other VMware certifications." An active VMware IT Academy can organize official courses about all the VMware curricula (see the details here: mylearn.vmware.com). The vITA has access to a lot of online teaching resources as official ebook, instructors' courses, manuals, lab guidelines. As ICT Academy is an association, you'll have access to special events and seminars, special offering and discount, regular updates about the VMware IT Program! We will reply back in 24 hours.